It may not bear the Tomb Raider name, but Lara Croft's next adventure features much of the same puzzle-solving action the Eidos series is famous for. 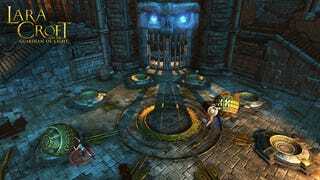 In Lara Croft and the Guardian of Light, however, the focus is on co-op. New screens of Lara Croft and the Guardian of Light highlight that emphasis on cooperative play. The two-person, giant ball-manipulating team—Lara Croft and her Mayan tribesman partner Totec—will be forced to endure all manner of brain-teasing challenges in order to recover that pesky Mirror of Smoke. If you have no idea what we're talking about, make sure to read our recent preview of the Xbox Live Arcade, PlayStation Network and PC game, due to arrive this summer. The Lara Croft folks also released this lovely piece of key art from the forthcoming XBLA/PSN/PC game, which is well worth downloading at huge resolutions.